I recently wrote a post explaining that I think a huge barrier to long term development of Ghana’s agricultural sector is changing the way that agriculture is perceived. Changing perceptions away from agriculture as hardship or poor man’s work towards engaging youth through showcasing agriculture as a business and as an innovative and exciting sector to invest in. Last week, we did just that. 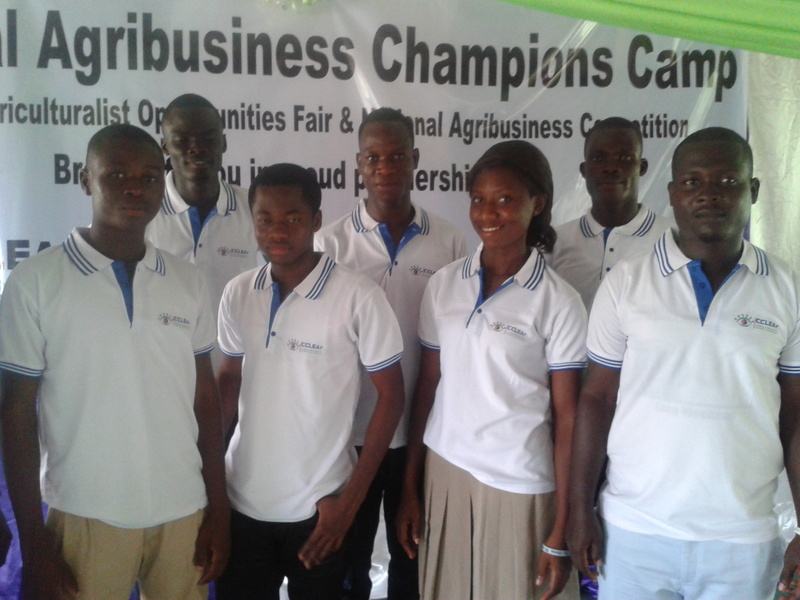 We ran a National Agribusiness Champions Camp during the 33rd Agricultural Colleges Student Union (ACSU) Games and Exhibition. 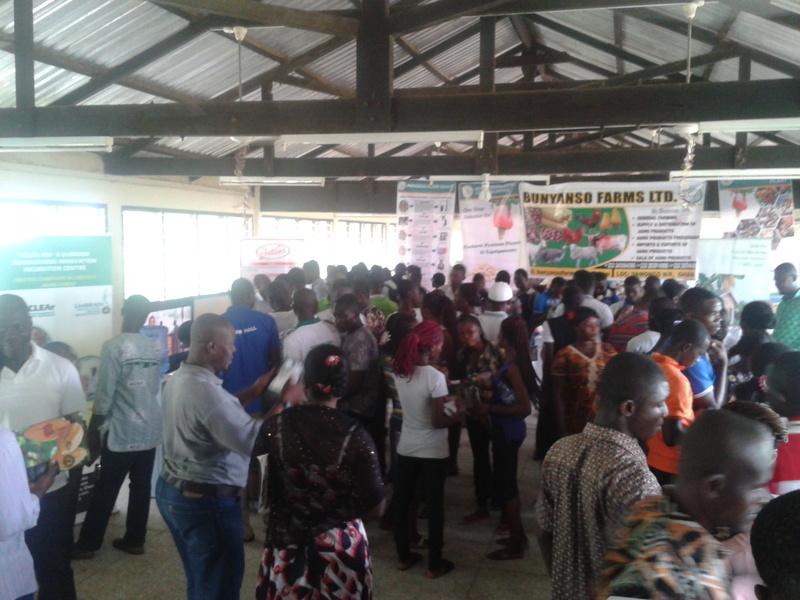 It included an Opportunities Fair which showcased a variety of private sector agricultural stakeholders introducing themselves and interacting with students. 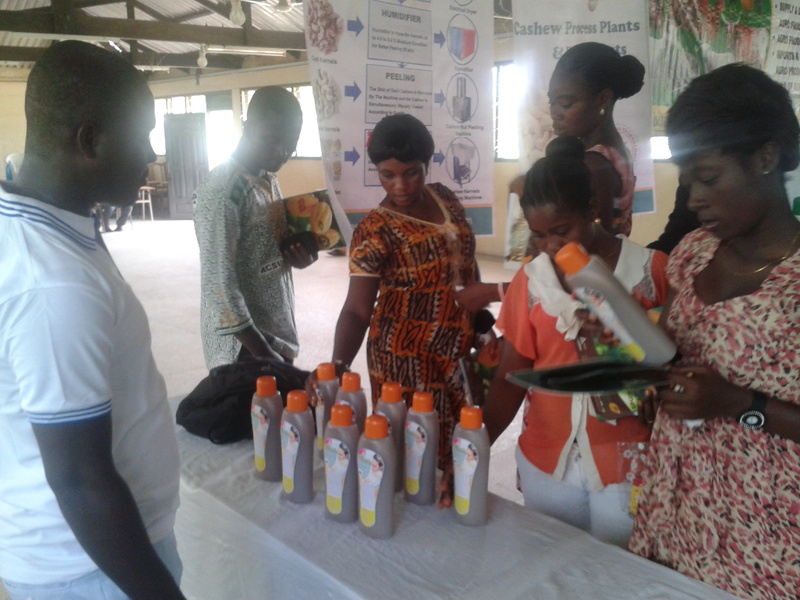 This was followed by a National Agribusiness Competition, in which youth from across Ghana pitched their innovative businesses. What did this program achieve? 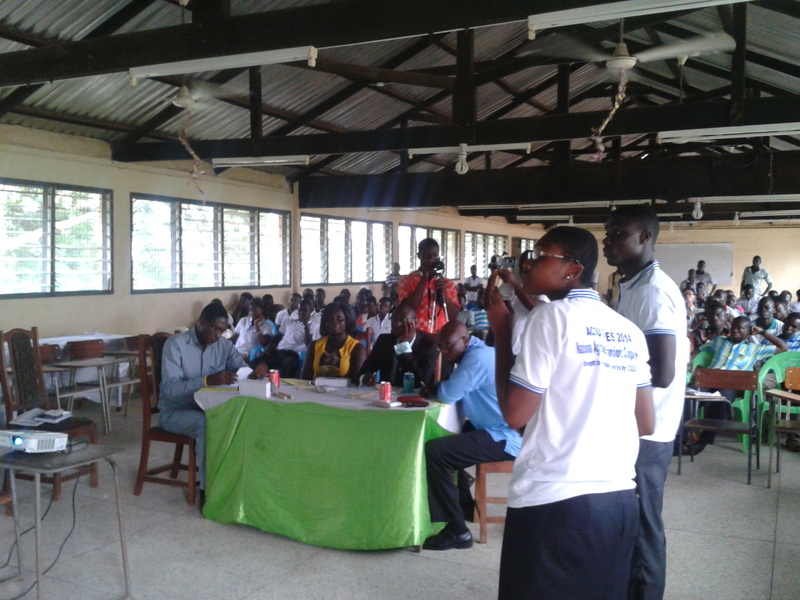 First, it broadened the mindsets and attitudes of the students as to what is available to them in this sector. They were able to see the breadth of the agricultural sector, with a lot of private sector opportunities showcased for them. It was amazing to see the students engaging with representatives of agribusinesses, asking so many questions and engaging in intense discussions! Students going through an Opportunities Fair. Students interacted with private sector. 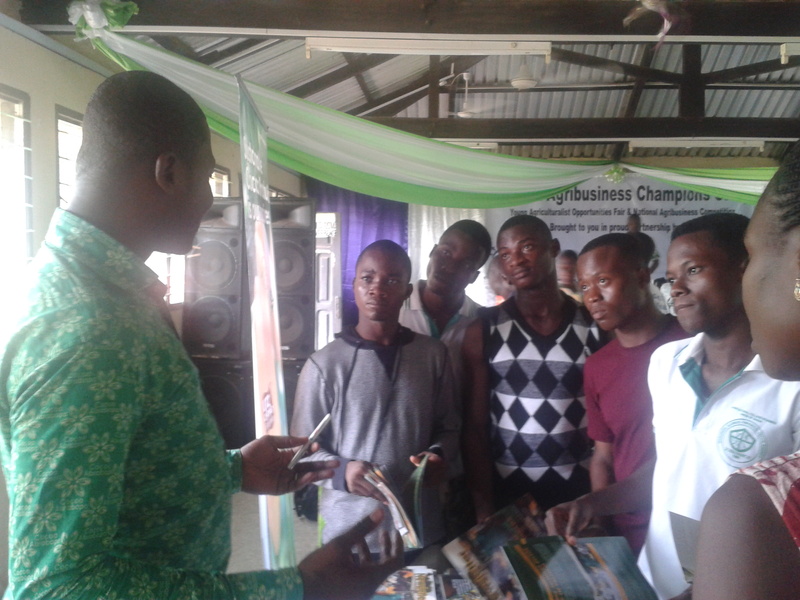 This Abrapo Cocoa representative introduces students to the private sector cocoa extension opportunities. Second, it invested in students’ knowledge, skills and attitudes in business and entrepreneurship. Students’ exhibited their innovative business ideas, pitching them in front of a panel of judges. This competitive arena not only benefited those students that were directly involved, but all those students that were observing and seeing their colleagues’ ideas, presentations and business models. Students pitching their innovative businesses to a panel of judges and their colleagues. Third, we highlighted how innovative students can be and their potential to impact the agricultural sector. The agribusinesses that the students pitched were not your basic business, they were innovative and exciting ideas with a strong business model to back them up. The students had already gone through a production cycle to help prove their model. Students check out the innovative products of their colleagues. The businesses were: beeswax candles to rival the normal white candles on the market, organic insecticide made from neem, a full scale piggery, a herbal lemon, honey and ginger drink and honey-based bathing soap. The herbal drink took the first place prize with a dynamic and convincing business pitch. Finally, it was a collaborative Public Private Partnership. Between EWB, a not-for-profit, CCLEAr, a private sector incubator as well as the colleges and ACSU, public sector bodies. It’s an exciting partnership with industry that we hope to see more of in the future of the colleges! A huge thanks goes out to CCLEAr, ACSU and each of the colleges for the roles that they played and their support! Last year we piloted the event at a smaller scale for the first time at the 32nd ACSU Games. Check out what Albert, the winner of that event, had to say about the impact it had on him by reading this post. Students competing in the National Agribusiness Competition. This event is just one example of how we can change the attitudes and perceptions of agriculture to engage youth and drive agricultural development in Ghana!